I recently stumbled upon an article looking for recommendations of any good/free TTS software by Elena Pullara, and came across the excellent screencast by Owen Holt using Google Translate to create alternate language audio files. This inspired me to try to create an on-demand "TTS generator" of sorts, from within Storyline, using the Google Translate API. Impressive work but still quite buggy for me. In IE11 it breaks up the content I past in the text box and in HTML5 it doesn't show the animated background (probably a video?) and just doesn't seem to give me any audio after a 1st try. Still if you could get this to work there would be a ton of applications. Weird, I'm on IE11 too, and it works for me. The background Is actually an SWF, but the AS version might be a little outdated, even for SL1. Thanks for noticing the html5 background issue though - I did forget to add one for html5 views. Thanks Steve, i also believe it's an interesting concept, maybe more suited to SL2 than SL1 because of the extra cue point and timeline triggers. I used a bit of a hack for this, I had to go through a proxy site to blank out the referrer tag, in order for the request to go through. The services you listed probably don't have this limitation. Most people don't know this but native text to speech is now available in Chrome and Safari on Windows, Mac and Linux, it's also available on iOS and Android Chrome browsers. We've made an app that creates a consistent voice experience across all devices and falls back to online services such as Google and TTS where HTML5 native Text to speech isn't available. I've also had an addon script built for SL2 that will speak each slide instantly and automatically, always reading the text from the slides. A free trial is available here near the bottom of the page, I'd love to hear your feedback. Anyone have any live links of their courses using TTS? 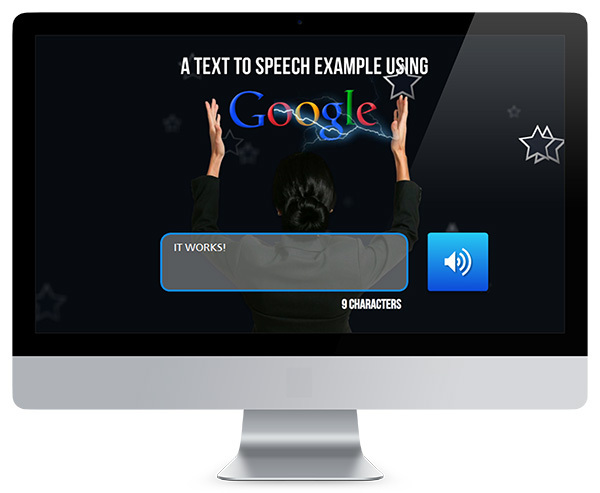 The current best text to speech software for your pc is Text Speaker. It is perfect for proofing and it also has customizable pronunciation, reads anything on your screen, and it even has talking reminders. The bundled voices are well priced and sound very human. Voices are available in English, French, Italian, Spanish, German, and more. Easily converts blogs, email, e-books, and more to MP3 or for listening instantly.